Promotional, Personalised and Customised Sweets! People love sweets! They're a totally fabulous way to bring a smile to someone's face and make them remember you. They're also a really fantastic way to make a colourful and vibrant visual statement - and lucky for us, we can offer you practically every colour under the rainbow. So... What Exactly Can A Quarter Of... Offer? Stacks and stacks! We have a massive range of sweets just waiting to be personalised -we can make customised sweetie bags or jars to your specification - just what you need to make your party or wedding the most memorable and original knees-up in the whole glaxy. Retro is seriously IN, so how about a 70s nostalgia party where everyone gets a little white paper bag full of Shrimps, Gobstoppers, Kola Kubes and Anglo Bubbly? ► Personalised wrapped lettered rock pieces. ► Personalised jars, any size, any colour. ► Little promo giveaway bags. 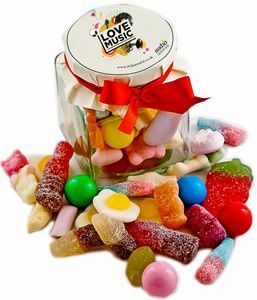 ► Wedding Favours - we can supply you with stacks of ideas for fillings, from Mini Love Hearts, to Heart Throbs, to Jelly Bean Hearts, to pretty pink marshmallows - we have loads of ideas. Read more here.